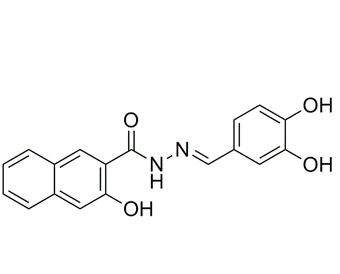 Dynasore is a dynamin inhibitor (IC50 = 15 μM). dynasore inhibits bone resorption by rapidly disrupting actin rings of osteoclasts. Dynasore disrupts trafficking of herpes simplex virus proteins. Dynasore enhances the formation of mitochondrial antiviral signalling aggregates and endocytosis-independent NF-κB activation. Dynasore protects mitochondria and improves cardiac lusitropy in Langendorff perfused mouse heart. Dynasore impairs cholesterol trafficking and sterol-sensitive genes transcription in human HeLa cells and macrophages.
. Macia E, et al. Dynasore, a cell-permeable inhibitor of dynamin. Dev Cell. 2006 Jun;10(6):839-50.
. Mues MB, et al. Dynasore disrupts trafficking of herpes simplex virus proteins. J Virol. 2015 Jul;89(13):6673-84.
. Gao D, et al. Dynasore protects mitochondria and improves cardiac lusitropy in Langendorff perfused mouse heart. PLoS One. 2013 Apr 15;8(4):e60967.